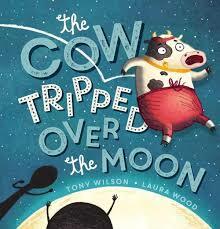 However, the message took on a deeper meaning when I told our students the story behind The Cow Tripped Over the Moon. For my beautiful Jack. You will jump moons. Jack is Tony’s four year old son who has cerebral palsy which affects the muscles in his arms and legs and also affects his vision so he can only see a couple of metres. Jack cannot walk by himself, or crawl, or sit for very long. Jack has to do daily therapy to help him do these things and displays perseverance every day. Jack is also a big fan of the Elephant & Piggie books just like we are in our library! You might like to read more about Jack or the process Tony followed to write his book in this blog post by Tony. This entry was posted in Uncategorized and tagged Perseverance, Tony Wilson by smotlrcblog. Bookmark the permalink.